East Bengal were trailing 1-0 and were awarded a free-kick in the opposition half. Early in the second half, out came the vanishing spray. It was a pleasant surprise for about 10,000 fans who turned up for the Calcutta Football League (CFL) opener between East Bengal and Mohammedan Sporting at the Salt Lake Stadium on Sunday. East Bengal were trailing 1-0 and were awarded a free-kick in the opposition half. As Mehtab Hossain placed the ball, referee Ajit Dutta pulled out the spray-can from his waist pocket and laid down the marker in front of the Sporting wall. 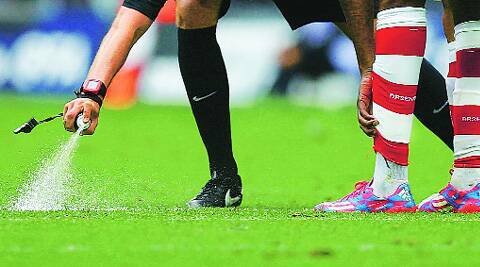 For the first time, vanishing spray was used in an Indian fixture. Vanishing spray was one of the major innovations employed at the World Cup in Brazil. One of the main sponsors, a German accessories company, had supplied the material there. Kolkata, though, used a Chinese version of the product instead. Calcutta Referees’ Association (CRA) secretary Udayan Halder admitted that vanishing spray has made the job easier for the match officials during free-kicks. “Opponents must remain 9.15 metres from the ball during direct free-kicks, but they have had a tendency to move the wall forward to shorten the distance. They can’t do it now. Free-kick takers, too, won’t enjoy any leeway. So from the referees’ point of view, this is an excellent thing which will allow more goals from set-pieces,” Halder said. For the record, Sporting defeated East Bengal 1-0 with Imran Khan scoring after 25 minutes. This was their first win in six years against East Bengal in the Calcutta League.